Posting Part II before Part I as I haven't quite finished the latter yet. I have always been fascinated with Harbour Grace. It's a community with great charm, wonderful history and beautiful scenery, but it's very much a place of the past. It was once the capital of Newfoundland and, in its heyday, was a strong economic centre in the New World. Many of the buildings constructed then remain today, but they're starting to fall into disrepair. It's beautiful and I can't quite figure out why it isn't a more desirable location for both tourists and summer homes, but there it is. Anyway, we stopped in for a visit on our way home from Salmon Cove and I had a chance to take a few photos. The light was strong and the sky blue, but I was one step ahead of the fog that was rolling up the harbour. It was moving at about the same speed as I was walking as I made my way along Water Street. My first stop was the Cathedral of Immaculate Conception, which is undergoing extensive renovations but retains its elegance nonetheless. As you can see from the apse (Am I the only one that has a typo for that word? Have to keep reminding myself that I'm not talking about snakes! ), the stonework is in serious trouble. Needless to say it was closed! It was actually rather sad to look at, with pigeons nesting in the chinks and bits of church lying around on the ground. While still beautiful, it seemed to be missing its dignity, if such a thing is possible for a building. I sincerely hope they finish the restoration job. 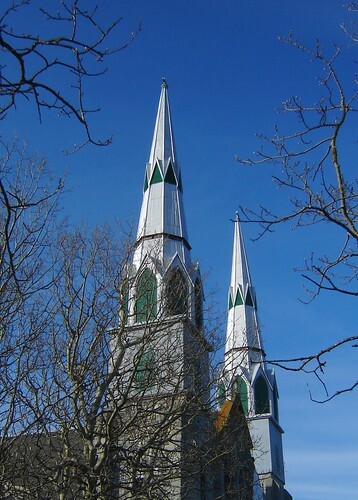 The steeples have been redone, but there's much left to do. I particularly liked the green and red and blue against the grey. 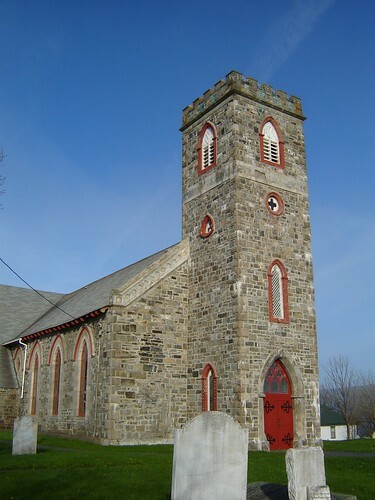 The feature of this church that is most frequently portrayed in artwork and photography is the pair of twin steeples. Against a blue sky in the strong light of evening, they simply glow. 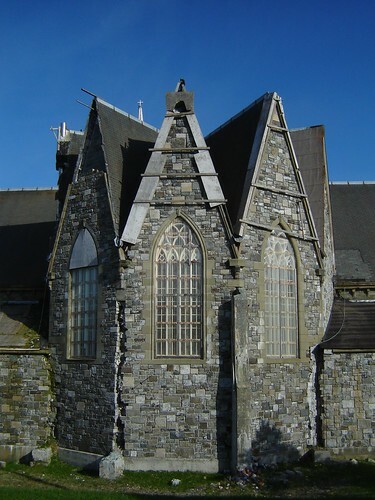 The front of the church is partially stripped of stonework. 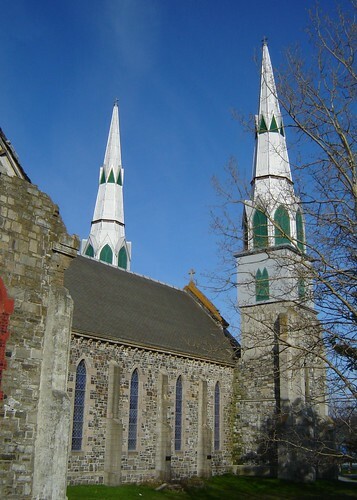 The steeples have been replaced and are no longer in danger of falling. I managed to grab the shot below, in which you can see the new concrete base of the steeple, awaiting recovering with stones. It'll be interesting to see how things progress over the summer. Walking west-ish along Water Street, I passed a ruined stone building. It was roofless and plastered with warning signs. I didn't go near, but found it oddly intriguing. 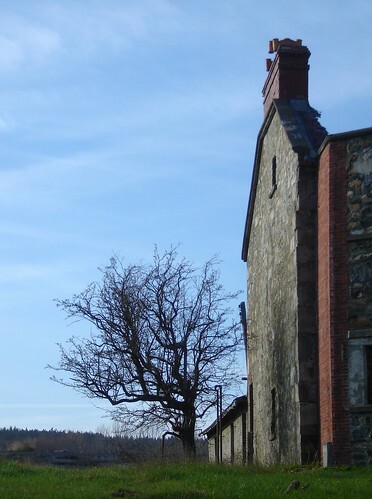 It looked to have been a stone house of some sort, with one bay window on the left. If you know what it is, please let me know. It's east of Cochrane Street and west of the Cathedral. 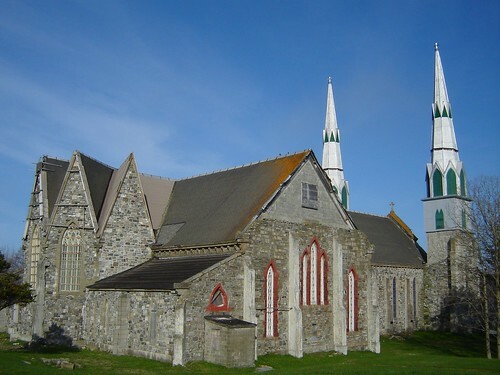 I was actually most intent on finding St. Paul's Anglican Church. I keep driving past and have never had a chance to stop for a photograph. The light was great and the colour of the sky quite complementary, so I managed a couple of nice shots. 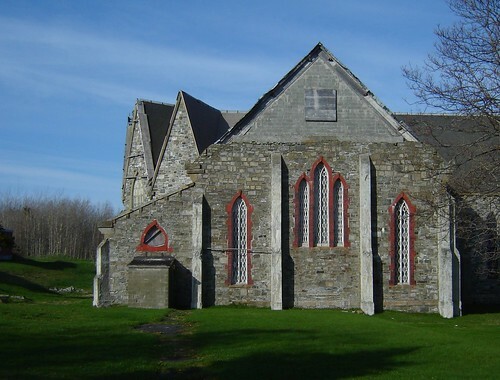 It's the oldest stone Gothic Revival Church in Newfoundland and was built in 1835. A beautiful building that has been carefully restored over the years. I was unable to get in (I arrived on a sunny Sunday evening, when no one was around the church), but will venture back during tourist season in the hopes of some interior shots. 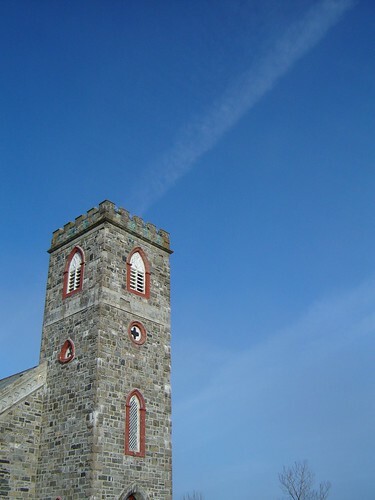 This is a lovely church to photograph, as the hint of red against a blue sky add such a nice punch. Even more wonderful is the fact that there aren't a lot of wires and poles around. Someone gave some thought to the exterior appearance when setting up electrical access and most of the wires are neatly tucked away in the trim and run from the non-photogenic corner. Getting things to line up in this shot was tricky, as the gate isn't straight, I'm pretty sure the church isn't quite vertical and I know the road wasn't at all flat. The real problem was that they were not at all in sync with each other! Note to others trying for the same shot: You get weird looks in small towns when you prostrate yourself in the road before a church. The camera is insufficient explanation. 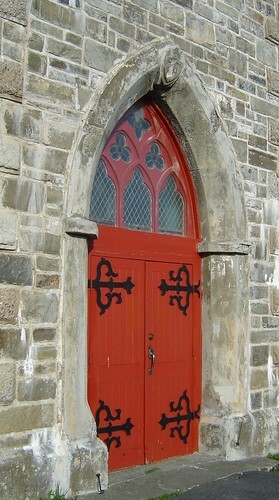 Especially love the one of the red door. 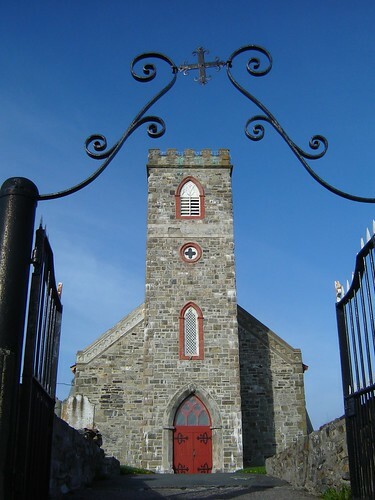 What lovely old churches. These are great photos Vicky! Thanks for sharing. The ruined building is Ridley Hall. It was slated for restoration, but unfortunately, the fire got it first. Fire destroyed what was left of it just a couple of years ago. I really enjoyed your site particularly Harbour Grace which is so dear to my heart for many reasons. However the grand lady as I have referred to Ridley Offices, had been neglected for many years. Upon my purchasing Ridley Offices it was in deplorable condition. 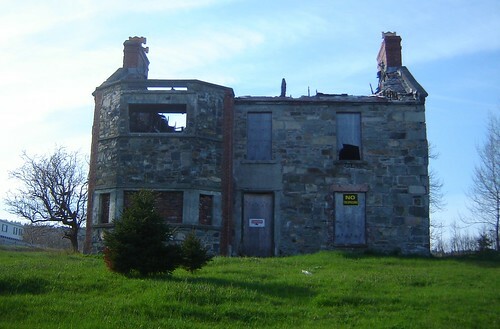 It has been a labour of love and I continue with the restoration of this very important Heritage Structure. I have to thank a wonderful man and Master Stone-Mason Elwood Coates from Turks Cove,Nl who has done amazing work on Ridley Offices. Without this fine gentleman, Ridley Offices may still be in disrepair. It is of vital importance in preserving these important structures. There are many in Harbour Grace alone, that are on the endangered list. These heritage structures are what links past and present; and in shaping the future.The need to increase awareness of the significance of heritage and safeguard endangered buildings such as Ridley Hall which sadly sustained significant damage in recent years due to a fire, can be saved. The need for vigorous action to raise awareness, stimulate initiatives and develop partnerships to carry out these projects is desperately needed.It has been noted that many of these structures generally endangered are due to neglect, adverse physical and climatic conditions, political instability. Communities in which heritage is highly valued are still left lamenting the loss of historic structures and character. The argument goes on about how to reconcile the need to protect and preserve buildings and structures often seen by developers as more speed humps on the road to profits, with the government’s demand for transparency, simplicity and speed. Once these Heritage buildings are lost there will be nothing for future generations to look back to. Without a shift in public thinking to act now. I fear the future of these structures are bleak.When they could be a vast asset for tourism, education, and identity. Thanks for sharing on your website. I am an avid family researcher and am currently researching my family from Harbour Grace. 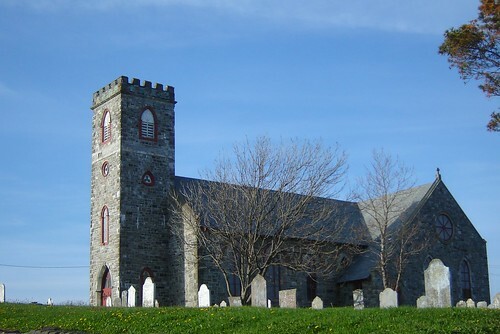 I have many ancestors buried in the graveyard of St. Paul’s Anglican Church. SO… seeing your great photos from different angles was simply wonderful. 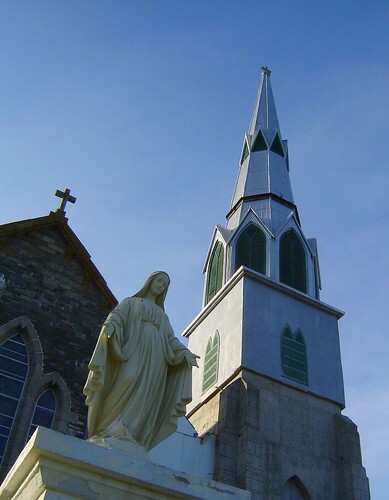 One of these days I hope to visit Harbour Grace. My family names are Alcock, Eastman, Jenkins, and DeWitt – later changed to White. Thank you for the lovely photos. My family is originally from Harbour Grace. My great grandparents were Charles Taylor and Mary Ann Robinson Taylor. I have had the blessing of returning to HG in 2002. It was so wonderful that my goal remains to live there one day.